This year is shaping up to be the year of the foldable phone. 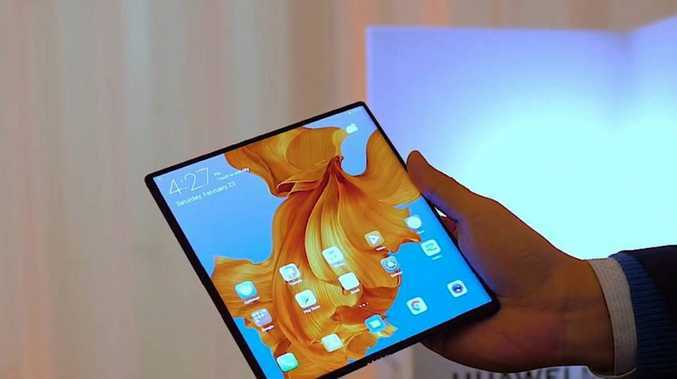 Huawei is the latest tech company to unveil a foldable smartphone device, debuting its forthcoming foldable Mate X at a packed launch event in Barcelona in the early hours on Monday morning AEST. It comes days after Samsung unveiled its foldable device, ushering in a new design that has been many years in the making. But Huawei's version takes a slightly different approach to achieve the all-new functionality. Unlike the Samsung Galaxy Fold, which opens up like a book to provide a larger tablet-like experience, the design of the Mate X sees the larger screen wrap around the outside of the gadget, rather than being enclosed on the inside. The result is a pretty stunning looking device that offers a whole lot of display. Early pictures of the Huawei Mate X leaked online hours before the event. The phone will be compatible with 5G networks, meaning users will able to enjoy the benefits of the hyper-fast network technology being switched on this year that promises to offer speeds 20 times faster than 4G. Unfortunately, (or perhaps intentionally) the cat was let out of the bag a day before the event when a billboard was erected in Barcelona, advertising the innovative handset. 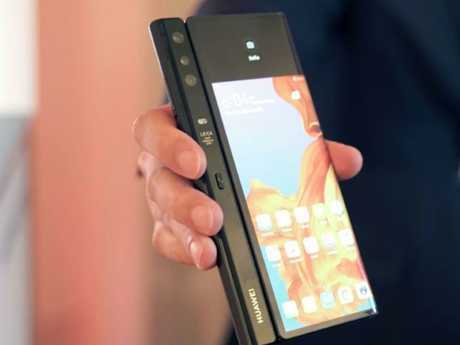 "The world's fastest foldable 5G phone," it said. When you open the Mate X, it has an 8 inch display from corner to corner with no notch. When it's closed it has 6.6 inch display "for one hand operation" and 6.38 inch display on the back. There is no gap between the panels when the phone is closed. A power button and finger print sensor on the bottom edge. On the back is a triple camera system which includes a 40 MP wide angle lens and an 8MP telephoto lens. When open it is just 5.4mm thick and 11mm thick when closed. On these metrics, it beats out Samsung's version which Huawei had no trouble with pointing out. Huawei is calling it the Falcon Wing Design and says the patented hinge has over 100 components. "Our engineers have been working on this for over three years. It is the most sophisticated hinge in the world," Richard Yu, CEO of Huawei Consumer Business Group said on stage this morning. 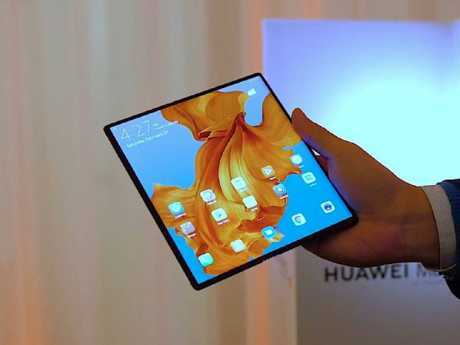 Huawei foldable phone is creating waves. With the larger display, users can do side-by-side browsing and multi tasking between two apps or tabs and it's clear with the 5G connectivity that Huawei is positioning this devices as focused on allowing users to increase productivity. It comes in just one colour, Interstellar Blue, but Huawei says it will likely add more colour options in the future. 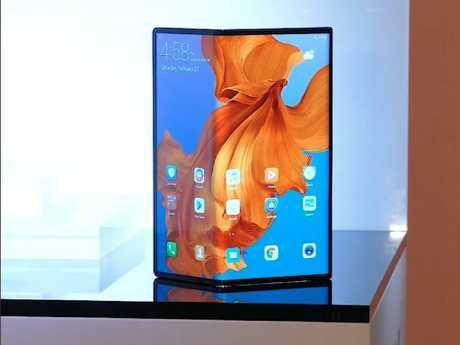 Huawei foldable phone on show in Barcelona. The Mate X has 512 GB of storage, 8 GB RAM and supports 55W super charging so users will be able to juice up the battery very quickly. Huawei has not yet announced Australian prices for the phone. Samsung's foldable phone started at just under $2000 for the US market so an Australian price will likely be north of $2500. Huawei's looks like it will be more expensive. Its pricing for the European markets translates to about $3600 in AUD. The Chinese tech giant is hosting its major smartphone event in Paris on March 26 and has confirmed it will be unveiling its P30 and P30 Pro on the day. The Chinese tech giant also unveiled a new range of laptops at the press event. Huawei debuted its MateBook X Pro at last year's MWC event, considered by many as a genuine rival to Apple's MacBook Pro laptops. This year it unveiled a slight update, dubbed the MateBook X Pro Borderless experience. The laptop pushes the screen to the edges with a 91 per cent screen to body ratio. "With this we want to bring you a nearly borderless experience," said Richard Yu, CEO of Huawei Consumer Business Group on stage this morning. The super thin laptop is just over 14mm at its thickest point and 7.9mm at its thinnest, for the 13 inch model. It comes with a touchscreen that boast a 3000 by 2000 resolution and 260 PPI (pixels per inch). Huawei says the laptops have faster Wi-Fi speeds and a more powerful processor and NVIDIA graphics card. It also boast a fingerprint scanner to unlock the device similar to that featured on Apple's MacBook range. It is the first PC with that feature. Huawei has also developed what it's calling OneHop technology that lets users quickly share media and files from Huawei phones to the MateBook X Pro in seconds with NFC technology (used in PayWave) and Wi-Fi Direct by holding the phone near the bottom right corner of the laptop. 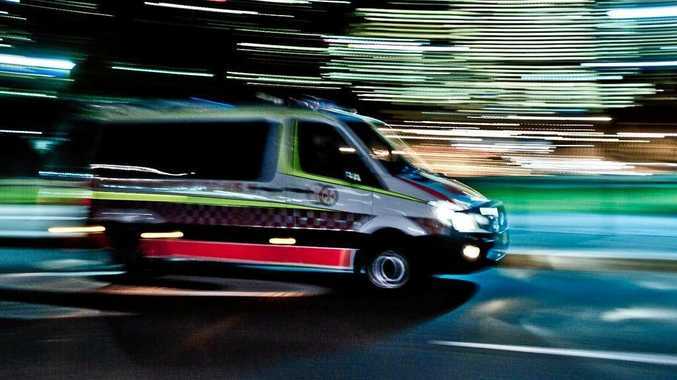 An onstage demonstration showed the convenience of the new feature but you'll have to have a Huawei phone to take advantage of it.